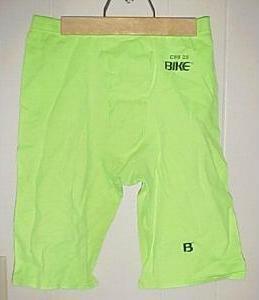 These neon green Bike shorts I won at an eBay auction in 2004. Seller was sportingguy27, and it was given the picture above to this description at the auction: You are bidding on a great Pair of BIKE Compression Shorts. They are in Great condition as seen in the picture and are size Medium. This is great for working out in, the big match, playin Ball, clubbing, or just lounging around.